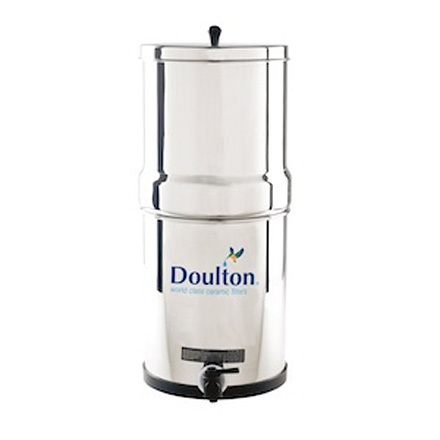 Dimensions: 19" x 8" x 8"
Doulton SS-2 Gravity Fed Filtration System is a portable stainless steel unit utilizing two 7" x 2" Super Sterasyl Ceramic Filter Candles each with 3 stages of filtration that doubles the flow rate and output. The SS-2 consists of two containers, the upper container is filled with untreated water which then filters down into the lower container, through the ceramic filter candles. The 7" Super Sterasyl Candles' filtration process reduces suspended solids, iron, hydrogen sulfide, trace contaminants, bacteria, cysts, turbidity, chlorine, as well as improving water taste. 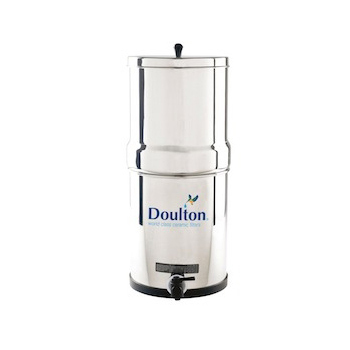 Doulton SS-2 W9361122 system is compact, portable and simple to operate. 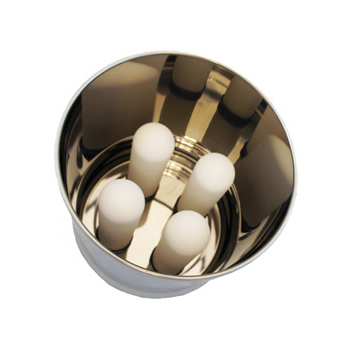 It is a pour from the top water filter that removes impurities via gravity through ceramic candles. It makes a perfect choice for Emergency Disaster Preparedness, Off-grid, Boats, RVs, apartments, summer homes and wilderness travel. System requires no electricity and is a complete , self contained unit that requires no electricity to operate - can be used outdoors too! All Doulton ceramic candles and cartridges are bacteriostatic - that is, self sterilizing for bacteriologically safe cleaning and handling. Compact, durable, lightweight and easy to operate. Fitted with self sterilizing and cleanable filter elements. Highly effective barrier to particles and pathogens at 0.2 microns. Enhanced anti-bacterial properties as ceramics contain trace elements of silver to inhibit microbiological growth. Easy pour through filling system. Comes with 2 (two) 7" Super Sterasyl Candle W9121200 filters. ** Will vary depending on water quality and usage. - Product specifications may change as a continuing product development by the manufacturer. - Candles have a domed end and a plastic mount on the top to fix them into the filter housing while cartridges (OBEs) have a plastic mount and rubber washer at both ends. - Suitable for gravity and low-pressure systems; not recommended for high pressure (high flow rate)systems. - Recommended Cleaning Frequency every 3 months or when water flow rate is noticeably lower. - Some restrictions apply to the sale and shipping of ceramic filters in the states of California, Iowa, Massachusetts or Wisconsin. - NSF certified to standards 42(Free Chlorine removal) and 53(Lead and Turbidity reduction).